New Jersey governor Chris Christie has signed into law the legislation which has been referred to as the "resurrection bill" for solar in New Jersey. New Jersey is the second largest market in the U.S. for solar energy, but its growth was threatened by a less-than-perfectly administered Solar Renewable Energy Credit (SREC) market. The new legislation, S1925/A2966, confronts the imbalance of SREC supply and pricing, which created uncertainty in the market for project developers and solar customers. According to the SEIA, the new law "accelerates the state's Renewable Portfolio Standard (RPS) solar requirement by about four years. Declining costs and an attractive investment environment caused solar deployment in the state to outpace demand. Acceleration of the RPS solar requirement will bring supply and demand in the market back into balance." And with this new legislation, the New Jersey solar miracle might keep rolling along, despite threats to derail its momentum. More than many other major markets, New Jersey’s solar status is influenced by political will and extensive renewable energy policy rather than abundant solar resources. The solar renewable energy credit (SREC) market in the state drives a significant amount of capacity installation -- credits are created through a renewable portfolio standard (RPS) which requires that a certain amount of energy generated in the state comes from solar. The price of SRECs is determined by the supply of solar generation and the demand to meet New Jersey’s RPS requirements. SREC pricing dropped precipitously in the last year. Shayle Kann, VP of GTM Research, said, "This bill will go a long way toward shoring up the New Jersey market beginning in Energy Year 2014. That said, it will not save the market from the increasingly drastic oversupply in the near term. We continue to expect a slowdown in installations in the second half of 2012, but this legislation means we could begin to see a resumption of growth in late 2013." "The legislation will prevent a complete collapse of the market, as was seen in Pennsylvania," added GTM Solar Analyst, Andrew Krulewitz. "This legislation was critical for the sustainability and continued growth of New Jersey's solar industry and the job creation that it brings," said Jamie Hahn, managing director of N.J.-based Solis Partners, a provider of commercial solar power systems in New Jersey. "Perhaps the most crucial part of the bill is the acceleration of the state's Renewable Portfolio Standard [RPS], which will help absorb the current oversupply of SRECs in the market and create a more modest demand for further solar development. This will help stabilize the solar industry and put more people to work." "There are two facts that everyone should keep in mind when discussing the solar market in New Jersey," said Stacey Hughes, CFO of SunLight General Capital, a solar energy developer and financier of projects throughout the Northeast. "One, New Jersey is the second largest solar market in the nation after California and among the top 10 in the world; and two, New Jersey's solar industry is one of the brightest sectors for job growth in the state. While other industry sectors lost jobs during the great recession, solar generated more than 3,500 new 'green-collar' jobs. The passage of this legislation will go a long way toward stabilizing the prices of Solar Renewable Energy Certificates and maintaining New Jersey's place as a clean energy leader. We should all support legislation that increases the accessibility of clean, affordable and sustainable electricity in a state with some of the nation's highest electricity rates." According to an article in NJ Spotlight, "Solar advocates argue the bill will eventually save consumers up to $1 billion because the measure dramatically scales back payments made by power suppliers if they cannot buy solar credits needed to comply with the state’s solar mandates." The bill provides incentives to deploy solar power on closed garbage dumps and brownfields, as well as at manufacturers and pharmaceutical firms while discouraging utility-scale solar projects on agricultural land. "This bill was important to stabilizing New Jersey's SREC process. The reports of the New Jersey solar market's demise were greatly exaggerated. There is a big difference between a decrease in incentive prices and a total market collapse. The best incentive programs decline gradually, in line with cost reductions, and we think this bill can allow New Jersey residents and businesses to continue to see substantial savings from using solar electricity." 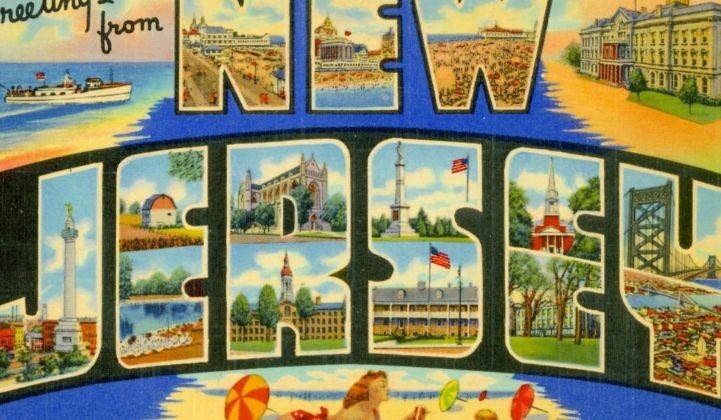 New Jersey and U.S. market information is from the U.S. Solar Market Insight: 1st Quarter 2012 report; more information can be found here.